Sporting some of the cutest fashions and striking some high fashion poses, these little tykes have some great style! Here are some of our most recent faves! Adorable and ever the perfect models, these two little ones definitely have fashion and style in droves! 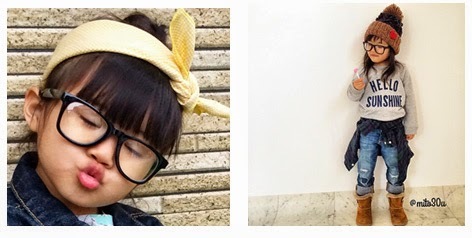 Too cute for words @mummyfashionblogger keeps 'fun' in style with some perfect fashion moments caught forever. Our friends in the US truly have style and fashion worked out. @ministylehacker can also give you some great tips about getting the Hollywood look for less. This trio sets the bar high on the style-o-meter with some great looks, awesome poses and striking eyes that catch you with every photo. Our Japanese mates offer us a totally awesome style that can't be beat! This little one is ready for her close up! Thanks to all the fantastic little models for sharing their super styles with us! If you think you've got an awesome style, send us a pic at info@idtee.com.au.